HPAC has been informed that the equipment in Horner Park will be replaced this fall with brand new equipment as part of the Chicago Plays! Program being administered by the Chicago Park District and Friends of the Parks. HPAC was given four schemes for the new design which we distributed to the community in February for a vote. The winning scheme was designed by NuToys and includes a new zip line, climbing structures, lookout towers, seesaws and spinning equipment. 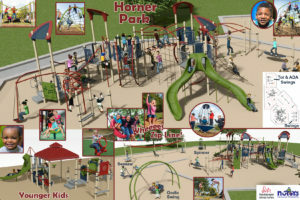 At HPAC’s request the plan will also include the same number of swings as we currently have. The fall timeline for construction is planned to cause the least disruption to summer camps in the park. HPAC thanks Chicago Park District for this initiative and Friends if the Parks for its role in administering the grant program. We also thank the community for their help selecting the new design. We look forward to more fun and safer play this fall.